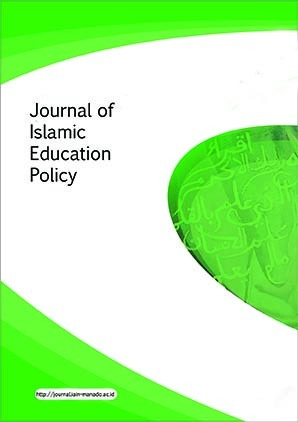 Journal of Islamic Education Policy menerbitkan hasil penelitian yang memberikan kontribusi signifikan pada pemahaman dan praktek pendidikan Islam melalui tulisan dan laporan akademik dalam perspektif dan skop global. Tujuan utumanya adalah membuka akses bagi dunia internasional, dengan tidak melupakan tuntutan lokal, pada hasil penelitian, yang meliputi peneliti, praktisi, dan mahasiswa dalam bidang kebijakan pendidikan Islam. Karena itu, JIEP menyambut dengan baik tulisan-tulisan yang mendorong perdebatan akademik dari kalangan akademisi yunior dan senior dalam tiga bahasa, yaitu Indonesia, Arab, dan Inggeris. Jurnal Ilmiah Al-Syir’ah, with registered number ISSN 1693-4202 (Print), ISSN 2528-0368 (Online) is a peer-reviewed journal published twice a year in June and December by Faculty of Sharia, State Islamic Institute of Manado (IAIN Manado) in collaboration with Southeast Asia Academic Mobility (SEAAM). 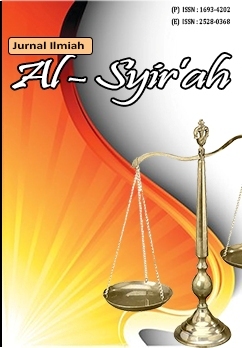 Jurnal Ilmiah Al-Syir'ah is a Communication Media between Sharia and Law Scholars (Law, Islamic Law, Sharia Economic Law and Social Society). Jurnal Ilmiah Al-Syir'ah invites enthusiasts and experts in Islamic Law and Legal Sciences to write or disseminate research results relating to Sharia and Law issues. Please read and understand the author guidelines thoroughly. Author who submits a manuscript to the editors of Jurnal Ilmiah Al-Syir’ah must follow the author guidelines. If the submitted manuscript does not follow the guidelines or using a different format, it will be rejected by the editorial team before it is reviewed. Editorial Team will only accept a manuscript that meets the specified format requirements. The articles published in Jurnal Ilmiah Al-Syir’ah have been double blind-reviewed by peer reviewers. The decision on whether the scientific article is accepted or not in this journal will be the Editorial Board’s right based on peer reviewer's recommendation. Jurnal Ilmiah Iqra', with registered number ISSN 1693-5705 (Print), ISSN 2541-2108 (Online), is a peer-reviewed journal published twice a year in June and December by Faculty of Tarbiyah and Education, State Islamic Institute of Manado. Jurnal Ilmiah Iqra' aims to publish conceptual, review and research articles in the field. The journal focuses its scope on the issues of Islamic Education in Southeast Asia. We invite scientists, scholars, researchers, as well as profesionnals in the field of Islamic Education to publish their researches in our Journal. Jurnal Ilmiah Iqra' have been double blind-reviewed by peer reviewers. The decision on whether the scientific article is accepted or not in this journal will be the Editorial Board’s right based on peer reviewer's recommendation. Please read and understand the author guidelines thoroughly. Author who submits a manuscript to the editors of Jurnal Ilmiah Iqra' should comply with the author guidelines. If the submitted manuscript does not comply with the guidelines or using a different format, it will be rejected by the editorial team before being reviewed. Editorial Team will only accept a manuscript that meets the specified formatting requirements.